The visual acuity of Haplochromis argens was measured during ontogeny using operant conditioning in a two choice discrete trial situation (cited from Van der Meer, 1995). The fishes were trained to distinguish a chess-board pattern from a grey target with the same overall luminance. The size of the squares were diminished until the fish was no longer able to distinguish the two targets. The major aim of the investigation was to test the predicted morphological data on resolution during growth in this species. H. argens was originally a widely spread endemic cichlid of Lake Victoria but has become a very rare species after the population-boom of the Nile perch Lates niloticus (Witte et al., 1990). It was a visual predator inhabiting the top layer of the open water areas where it used to feed mainly on zooplankton and Chaoborus larvae (Goldschmidt et al., 1990). A full glass tank of 100 x 50 x 50 cm containing about 150 l of water (26oC) was divided in several compartments of variable size. The water was constantly circulated, filtered and aerated. Before the training the fish accommodated in the main compartment. During the day the tank was illuminated from above by a 40 W fluorescent tube at 70 cm above the water surface (about 250 lx). With the hatch, attached to the front of this compartment, in the up-position, the fish had access to two cylindrical passages (23 cm apart; 12,6 cm length; 24 mm diameter), connecting the central compartment with two cylindrical compartments (12 cm length; 65 mm diameter). At the far end the cylindrical compartments tapered over 6,9 cm to a diameter of 43 mm at the potential patch, where they terminated at the glass wall of the tank, directly behind which the visual stimuli were exposed. Altogether, the distance between the fish’s eyes at the entrance of the passage and the stimulus outside the tank amounted to 33 cm. To facilitate automatic detection of the fish moving from one to another compartment, the passage-walls held two pairs of opposite pin-holes (10 cm apart), each of which holding the end of a versatile fiber optic connection (Hewlett Packard HFBR-0501) mounted above the water-surface, which communicated with the Control & Operation System (COS). Continuous positive reinforcement was executed by the administration of live-food, preferably Choaborus larvae, obtained from a local aquarium shop. The smallest fishes were rewarded with a mixture of Cladocera and Copepoda from my own pond. The dispenser was positioned inside the tank at the far end of the cylindrical compartments, with short outlets (4 cm) to both potential patches. A uniform suspension of prey was realized by means of a constant water circulation generated by an aerating stone. The specific shape of the dispenser reduced turbulences and prevented accumulation of food-items. The valves were of a similar construction as in the dispenser described by Northmore (1968). A tevlon ball at the lower end of a stainless steel bar suspending from an electromagnet rested in a tevlon seating thus shutting off the 6 mm diameter drain hole by the weight of the bar. On a pulse of current the electromagnet elevates the bar, allowing a few ml of suspension to flow through the drain. The amounts of food items per delivery depends on the type of prey, the duration of the current pulse, the degree of elevation of the bar, the particle concentration and the difference between the level of the suspension and the water level in the tank. These variables were adjusted experimentally to fit the required number of food-items per delivery. Satisfying results were obtained with a current pulse duration of 0,1 s, elevation of the bar of 4 mm and the suspension level about 15 cm above tank-water level. A suspension of 150 Chaoborus larvae per litre provided a mean rate of 1,57 larvae per delivery (n = 100; sn-1=1,10). 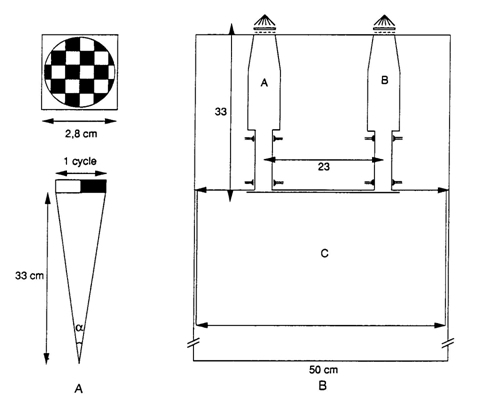 The electromagnets moving the valves communicated with the COS.
Test slides of a black and white chess-board pattern were produced by photographing a screen pattern (alfac-tone 05306 & 05301) at different magnifications, resulting in a variable distance between similar squares (black or white) from 10 to 0,24 mm. The slide with the smallest squares was practically neutral grey and used as the positive stimulus. Accordingly, the rewarding stimulus was never constant during the entire experiment, providing a high constant level of learning (Neumeyer, 1984). 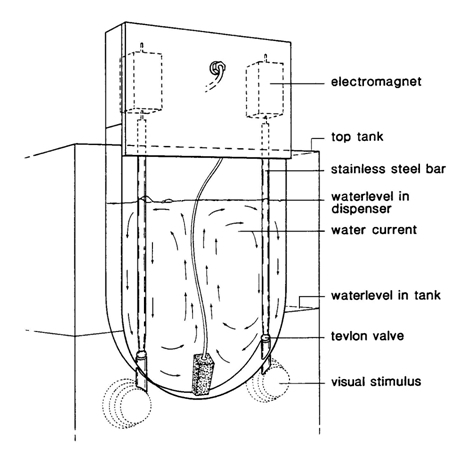 Twenty slides were mounted on a disc, which was positioned at the far end the cylindrical compartments outside the tank and close to the glass wall, in such a way that simultaneously a positive and a negative stimulus were presented at the patches of the cylindrical compartments. Since these paired slides were randomly mounted, the positive (and negative) stimulus was not fixed to one compartment. The disc could be rotated stepwise in both directions, thus presenting a new pair of slides. The actual stimuli were presented by switching on the lights (halogen, 6V, 0,4A), which diffusely illuminated the slides from behind. A sensor reading the position of the positive stimulus during presentation, communicated with the COS, together with the lights and the motor rotating the disc. The behaviour of the fish was recorded by video observations and stored by the COS. After accommodation (24 hour) of a fish in the central compartment, the hatch was opened and a positive stimulus together with some live-food was presented in both cylindrical compartments. This was repeated only after the fish had returned from a cylindrical compartment to the main compartment. Very soon the fish showed little hesitation to swim through the tubes in search for food at the patches. From then on a positive and a distinct negative stimulus were presented simultaneously, with potential food supply (reinforcement) only at the patch with positive stimulus. When choosing the negative stimulus the fish was denied a reward by immediately breaking off the stimulus presentation (by switching off the slide illumination). When choosing the positive stimulus the fish was rewarded with food items and the slide illumination was switched off only after the fish had returned to the main compartment or at the most after 60 s. With daily two or three training sessions of one hour each, most fish were sufficiently trained within a fortnight (over 80% positive score). When specimens were unsuccessful, usually due to disturbances during the training procedure, they were replaced. The testing procedure only differed from the training procedure in the presented negative stimulus, which was an increasingly finer pattern (smaller black and white squares). Several discs were used, each of which holding one type of negative stimuli. Due to random choice of the direction of the rotating disc, the location of the positive stimulus was highly unpredictable. Before a fish was confronted with a finer negative stimulus, it was retrained with one of the more distinct negative stimuli. At the onset of the testing procedure the video recorder was started, the slide illumination was switched on and the hatch was opened. By swimming through one of the tubes the fish interrupted two small light beams. If the fish had chosen to swim towards the positive stimulus, interruption of the second beam caused administration of live-food (reward). If the fish had chosen to swim towards the negative stimulus, interruption of the second beam caused the switching-off of the slide illumination. When the fish returned to the main compartment, the interruption of the first light beam (closest to this compartment) caused i) successively a switching-off – if not already – of the slide illumination, ii) one rotation step of the disc and iii) re-illumination of the slides, after which the next trial could start. Each time the position of the positive stimulus was registered by the COS, while every single event (e.g. negative stimulus in A; light on; fish out of C; fish in A light off; etc) was stored as a function of the proceeded time. The trained specimens were exposed to progressively finer negative stimuli and their capability to distinguish these from the positive stimulus gradually decreases. 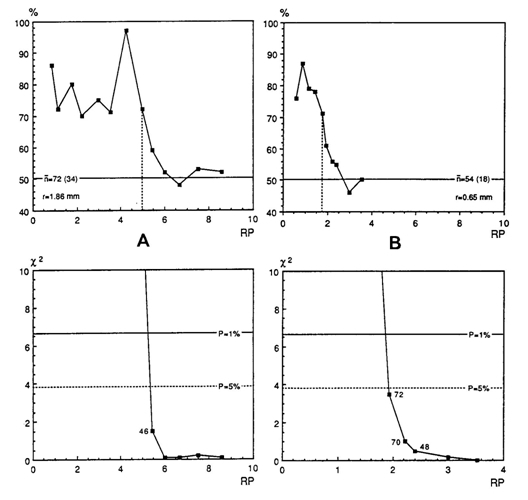 The Chi-square test (Sokal & Rohlf, 1973) was used to decide at which point the fish had still statistically significant (p<0,01) preference for the positive stimulus. The finest stimulus that fulfils the condition was defined as the resolution of the specimen concerned. Visual acuity, expressed as the minimum separable angle (a) in minutes of arc improved from about 36 min. 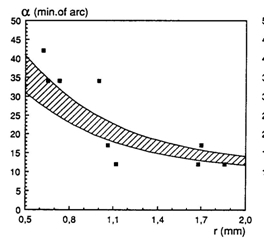 of arc in large juveniles (SL >3 cm; r = 0,65 mm) to 12 min. of arc in adults (r = 1,86). As the visual stimuli were always in front of the fish when made their decision to enter or not enter a cylindrical compartment, the image of the stimulus was projected on the back of the eye (caudal part of the retina). In this region the cone density is highest throughout ontogeny the anatomical resolution based on a visual unit of four double cones surrounding a single cone (Otten, 1981) coincides pretty well with these behavioural measurements. The values of the minimum separable found in adult H. argens were not as low as the ones earlier measured in Aequidens portalegrensis (Baerends et al., 1960) and Hemichromis bimaculatus (Baburina et al., 1968). This may be due to a difference in calculation (Van der Meer, 1995) or to an actual better resolution in the latter species caused by, for instance, larger eyes.